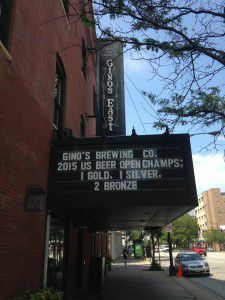 Gino’s Brewing Company, located at Gino’s East River North (500 N. LaSalle), won four coveted awards at the 2015 U.S. Open Beer Championship, beating out nearly 4,000 submissions, and as only one of two Chicago area breweries to win. Breweries from China to the Czech Republic submitted beers and ciders to be judged in the 2015 U.S. Open Beer Championship, with the winners announced on July 4. Gino’s Brewing Company’s small batch beers expertly crafted by Brewmaster Kevin McMahon won a gold, silver and two bronze awards at the international competition. The Silver Medal for Extra Special Bitter went to Broken English, a full-bodied, sessionable English pub ale. English Marris Otter, CaraMunich, and Belgian Special B offer a biscuity sweetness to its rich amber color. The English East Kent Goldings and Challenger hops offer floral and piney nose with a hint of lemony citrus. Gino’s Brewing Company won the Bronze Medal for Killarney Connection in the Foreign Stout Category. This craft beer is named after the town of Killarney in Southwestern Ireland. Roasted Barley, Chocolate, and Black Malts offer its obsidian color while also attributing a roasty espresso and dark chocolaty sweetness to the nose. With a creamy tan head, and balanced finish, this is a wonderfully drinkable stout. Gino’s Pale Ale won the Bronze Medal in the Belgian Pale Ale Category. A touch of biscuity sweetness, paired with the fruity aroma of Amarillo and French Aramis hops, helps round out the spicy characteristics of the blended saison yeast culture.